A colossal aircraft capable of launching satellite-toting rockets into space is closer to testing, having been rolled out of a hangar in the desert, its creators said on Wednesday. 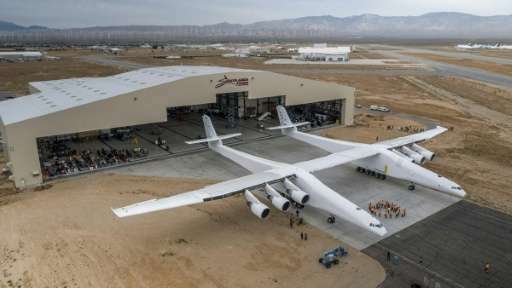 The project backed by billionaire Microsoft co-founder Paul Allen has been proceeding for about six years and was on track for its first launch demonstration as early as 2019, Stratolaunch Systems Corporation chief executive Jean Floyd said in a blog post. "This marks a historic step in our work to achieve Paul G. Allen's vision of normalizing access to low Earth orbit," Floyd said. "This is a first-of-its-kind aircraft, so we're going to be diligent throughout testing." In the weeks and months ahead, Stratolaunch—touted as the biggest airliner ever built—will be testing fuel systems, engines and more on the ground at its air and space port in the Mojave desert, according to Floyd. Support structures were removed from the plane during the past few weeks, allowing it to rest on its 28 wheels for the first time. The Stratolaunch aircraft weighed in at 500,000 pounds (226,796 kilograms) and has the world's largest plane wingspan, measuring 385 feet (117 meters), according to the company. The aircraft is 238 feet from nose to end, and it is 50 feet from the ground to the tip of its vertical tail. When the ambitious venture was launched some six years ago by philanthropist Allen, partners in the project vowed it would revolutionize orbital travel in the post-space shuttle era. Using huge passenger jet engines, it would tote a rocket and be able to launch payloads, satellites and someday humans into low-Earth orbit, Allen said at the time. Allen vowed that the project would result in greater flexibility than ground-based rocket launches and better cost effectiveness for cargo and human missions to space. Private space travel is also among the big visions of tech industry star Elon Musk, founder of SpaceX as well as electric car company Tesla. SpaceX is poised to blast off its next delivery of food, supplies and science experiments to astronauts living at the International Space Station on Thursday. The launch of SpaceX's 11th commercial resupply mission aboard an unmanned Dragon cargo ship is scheduled for 5:55 pm (2155 GMT). If all goes as planned, a Falcon 9 rocket will propel the Dragon into low-Earth orbit, where it will eventually connect with the space station, circling the Earth at a height of some 250 miles (400 kilometers).